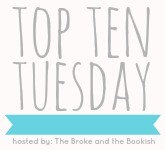 This week's Top Ten Tuesday prompt asks which book series would you like to read, but haven't yet. Some of my favorite books are a part of a series. We have a love/hate relationship, though. I love that the story continues past one book, but I loathe the wait time in between. When they're good, you HAVE TO know what happens next! Also, when the wait time extends a bit too long.. I have a tendency to forget and push aside. Eek! Some series can be a serious commitment and that can be intimidating, too. I do want to read these... eventually. Oooo many of these are in my list too. I can't believe you want to start Graceling. I AM SO EXCITED! Our little Ginger's gonna try fantasy yayyyy!!!!!!!!!!!!!!!!!! I've started quite a few you mentioned, but the only one I've finished is Graceling - which I loved! You are going to adore Patrick Ness's books. I can see the plot and the writing having a lot of appeal for you in particular. I just finished Cinder yesterday and it was mind-blowing. Graceling is great as well. Personally I wouldn't prioritize AtU or DoSaB too highly. They're both only okay, but that's a matter of personal opinion. I want to read Across the Universe too. I have the first book, but I still haven't read it yet. Seriously though, you have to read Under the Never Sky -- you won't regret Perry. There's so much fantasy/dystopia/sci-fi on your list and that makes me absurdly happy (in the best way possible). Here's to trying new things! - YAY FOR GRACELING! I need to read the first two as a refresher before I attempt Bitterblue. But I love this series, and I sincerely hope you enjoy them. - I'm determined to start the Chaos Walking trilogy this year, as I've heard nothing but good things about this series. The idea of doing it scares me a little though! - I really need to read Daughter of Smoke & Bone, since I'm so curious about that cover and people say it's really good. Ditto regarding Under the Never Sky! - A Rogue by Any Other Name is fun! I enjoyed it a lot when I read it, and I really need to get started on the next book. My favorite item on your list though is CINDER. I loved that book so, so much. I am in awe of Marissa's ability to tell a good story. Her characters are well-formed, her world is interesting and the story is TOPS. I still have to read Under the Never Sky and Cinder too. :) So many books, so little time. Cinder and The Knife of Never Letting Go are both great. Daughter of Smoke and Bone is also really, really good, but I'd rank it just a little underneath the first two. My roommate just finished Graceling and Fire, and is now trying to force them upon me. I hope to get to them soon too! I wan to start a lot of these series too, especially the Chaos Walking trilogy. I need to hunt out a copy of Daughter of Smoke and Bone soon, I keep passing it up but that's something that's probably got to change haha! Just read The Lunar Chronicles, haha! They will blow your mind away with how amazing and awesome and phenomenal they are! Look at you working on this list already! HA! :D Hope you like Exclusively Yours!! And, YES! You must get to Daughter of Smoke and Bone soon!!!! o.O Read Graceling! One of my favorite series. Great characters. Here's my TTT for the week. Happy reading! Girl please. You KNOW how I feel about #2 and #3!